Yes it’s another ABBAlicious special coming Sunday week on Seven. This one, landing like a helicopter on the Arrival helipad, promises interviews with Meryl Streep, Pierce Brosnan, Colin Firth and Julie Walters. 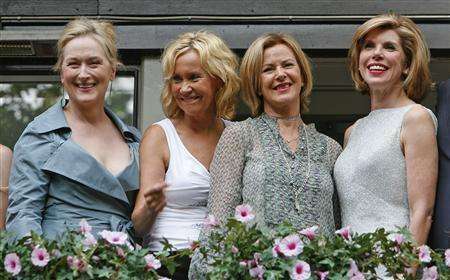 ABBA: The Mamma Mia! Story screens at 6:30pm Sunday July 20. There’s a bunch of other bits for die-hard fans too, but sometimes these specials are very free spirited in their extra footage. If there’s anything as landmark as Agnetha’s appearance (pictured) last week that’s a different story. For the record, David Stratton on the ABC gave the film a 3.5 star review ahead of Margaret’s 2 stars. As the latest movie blockbuster hits the world cinemas, we take a unique and exclusive behind-the-scenes look at the global musical entertainment phenomenon – MAMMA MIA! Including intimate interviews with the stars MERYL STREEP, PIERCE BROSNAN, COLIN FIRTH and JULIE WALTERS as well as the original band members of ABBA. A never-seen-before look at the auditions, rare archive footage of ABBA in action and contributions from celebrity fans including KYLIE MINOGUE, GERI HALLIWELL and DAWN FRENCH. Toriwannabe (great choice of name there :), well said. I don’t know why the two girls from the band are even involved in promoting this film. They had nothing to do with the songwriting and they haven’t sung an Abba song in decades. Benny & Bjorn, meanwhile, are turning into the Brian May & Roger Taylor of Europop. I wish they’d just leave it alone. The quality of the records speaks for itself. Why have the 2 guys in the picture anyway? It’s not like Benny and Bjorn did much of anything, is it? Oh yeah, they just WROTE the bloody songs! Don’t let that stand in the way of a pretty picture though. Yeah i knew the others were on the edge of that shot. It would have been nice to have a shot of just the four of them alone but it seems they weren’t interested. This is cropped from a wider shot with more cast Benny & Bjorn. Haven’t specifically spied one of the four exclusively. Margaret and David disagreeing on a movie now that’s a surprise! I’m amazed that they couldn’t get at least one photo of the foursome together as they were all there.